Valentine's Day is around the corner, and love is in the air!💕 Hubby and I will also be celebrating our 18 amazing, wonderful, fantastic years together. I guess that time flies when you are having fun! This will be my first and only Valentine's Day themed lunch for this year, you can find my previous ones HERE. 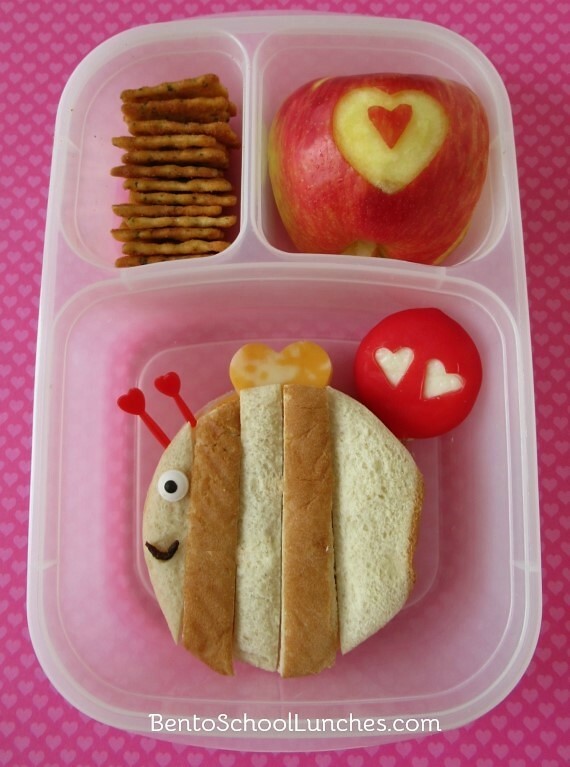 In this bento lunch: I used a large circle cookie cutter to cut the body of the Bee, with the end of the loaf as an extra layer for the sandwich which created the bumble bee stripped effect when sliced and the pieces alternated. I used a heart shaped cutter to shape the tiny wings from Colby-Jack cheese. I used a candy eye while the mouth was made from a slice of raisin and the antennae are picks. Also included are some flatbread crackers, an apple which was decorated using two heart shaped picks and removing the outer layer carefully with a knife, and a Babybel cheese which was cut using the same cutter. This lunch is packed in our Easylunchboxes container. Do you have any plans for this Valentine's Day?